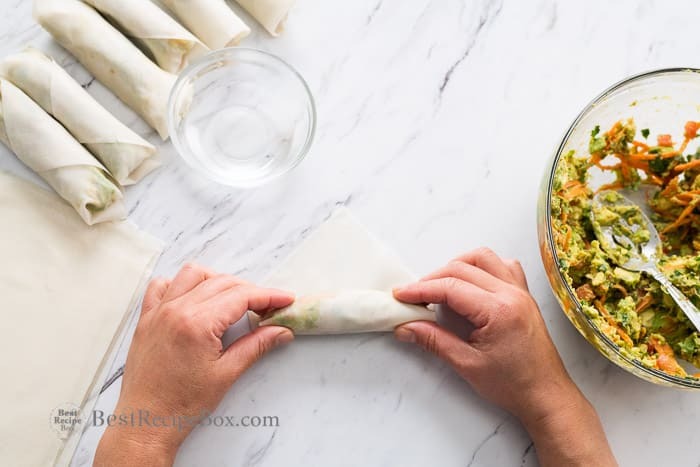 Have you ever tried avocado egg rolls before? Years ago we had them at Cheesecake factory. 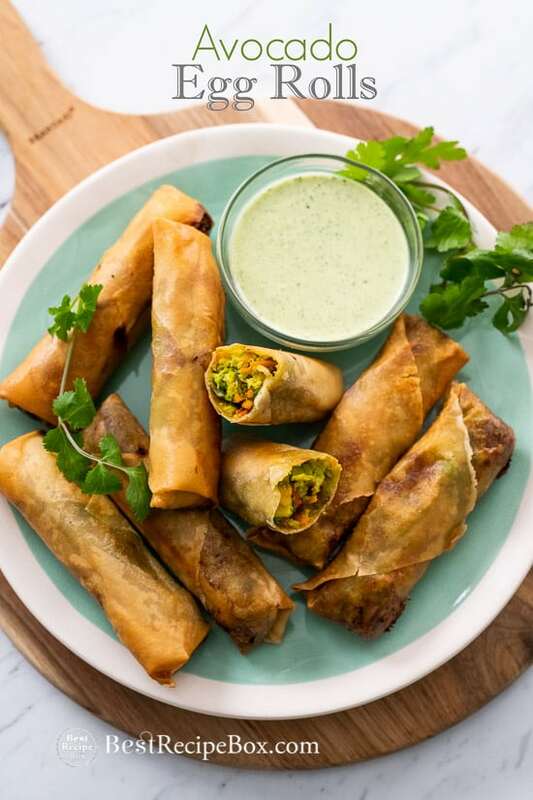 Since then, we’ve been wanting to create an avocado egg rolls recipe inspired from that meal. And now here it is! These are truly are fun to eat. They’re definitely not authentic egg rolls in any way. But if you’re a fan of eggs rolls and avocado, then these are for you. 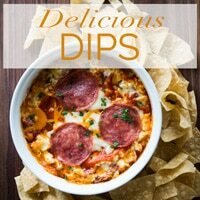 They’re a fantastic appetizer to have at a Game Day or Super Bowl party. Everyone will love grabbing a few of these and dipping them in our creamy cilantro dipping sauce. YUM! 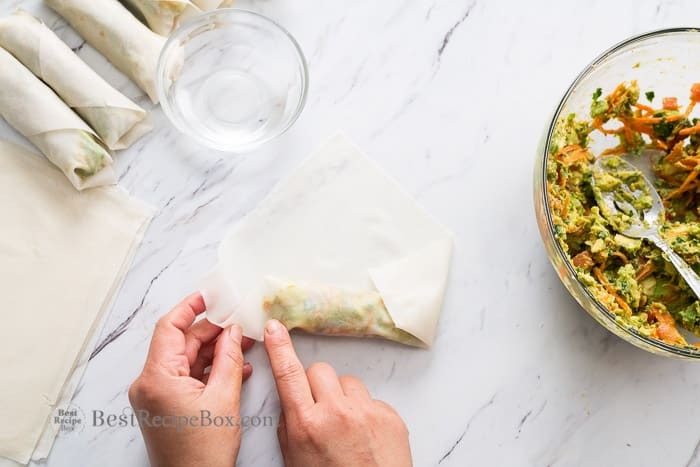 These are like guacamole egg rolls. 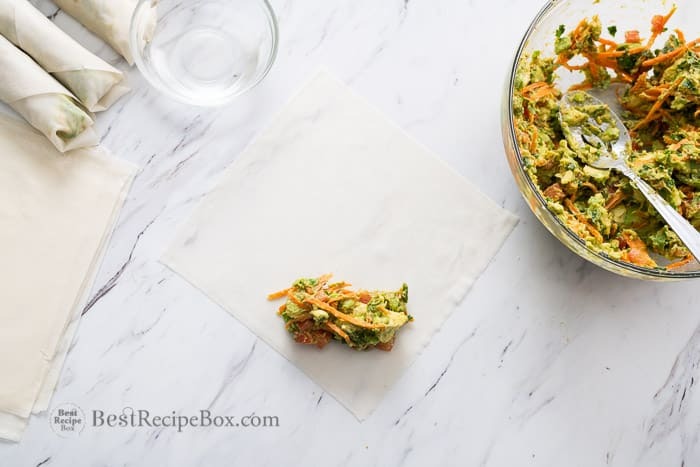 Our recipe is like a chunky guacamole egg roll filling with carrot add to it. The creamy avocado mixture inside the rolls is flavorful and delicious. 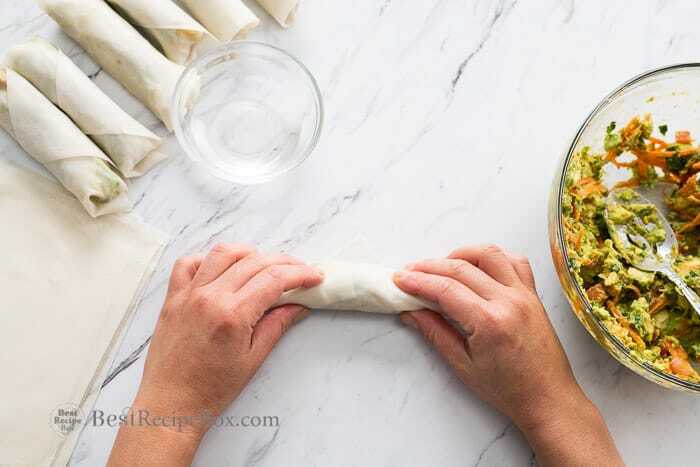 We like to add shredded carrots in there to give the egg rolls more structure and firmness. Besides, extra vegetables are always good for you too! A platter of these will be a crowd pleaser at parties. 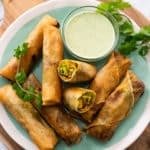 Avocado egg rolls are so easy to make and so popular. 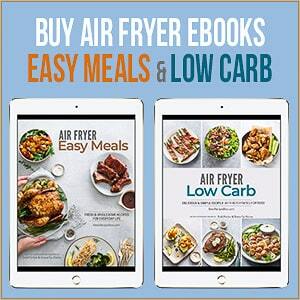 You might need to make extra because everyone will be devouring them so fast! Mash avocado to chunky texture. Add rest of filling ingredients. We didn’t want to have mushy avocado egg rolls. 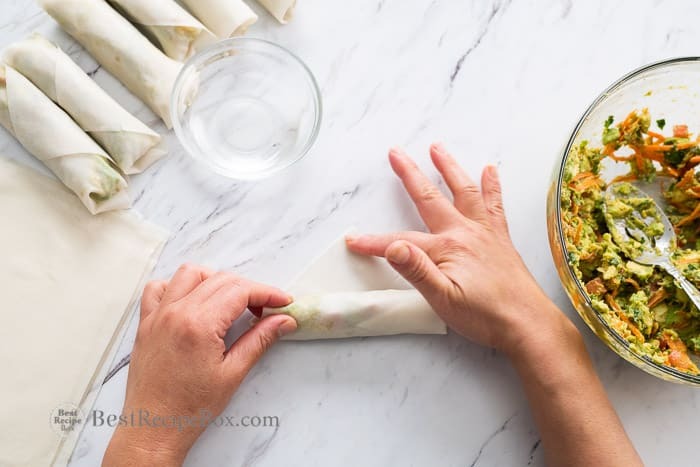 Adding shredded carrot give great structure and flavor to the egg rolls. Also, extra veggies are always a plus! Eating these fresh and hot is best because they'll be more crispy. The moisture from the avocado will them them soften fast. 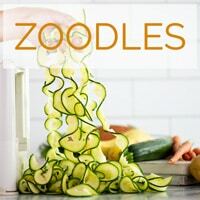 Combine all the ingredients in a blender (oil, water, mayonnaise, parmesan cheese, lime zest, lime juice, cilantro, garlic, black pepper, salt, and sugar) until everything is smooth. Set aside. In bowl, mash the avocados to a chunky texture. Add carrots, onions, tomato, cilantro, lime juice, garlic powder, paprika, salt and pepper. 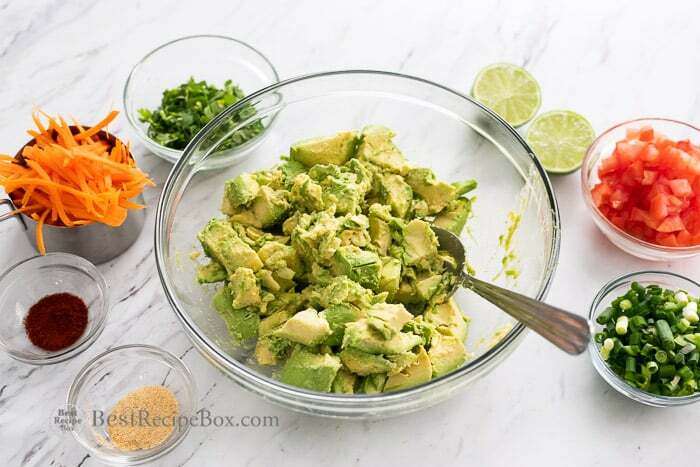 Stir to combine evenly, but try not to over-mix and lose the chunky texture of the avocados. Taste the filling and add additional salt and pepper if necessary. 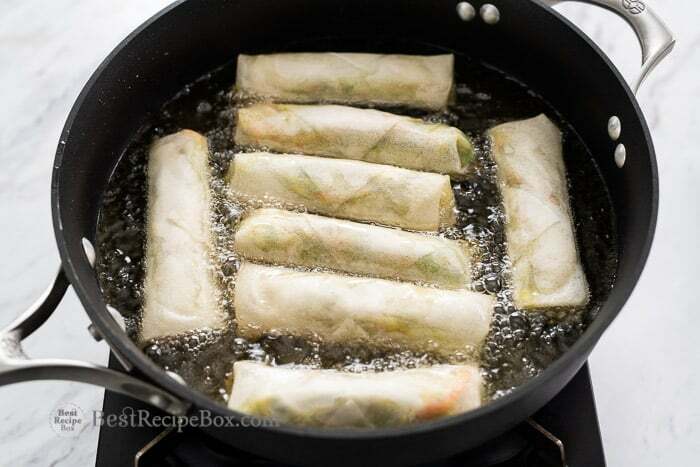 Rolling & Frying: Using egg roll wrappers or spring roll wrappers, add about 2 Tablespoons of the filling to each wrapper. 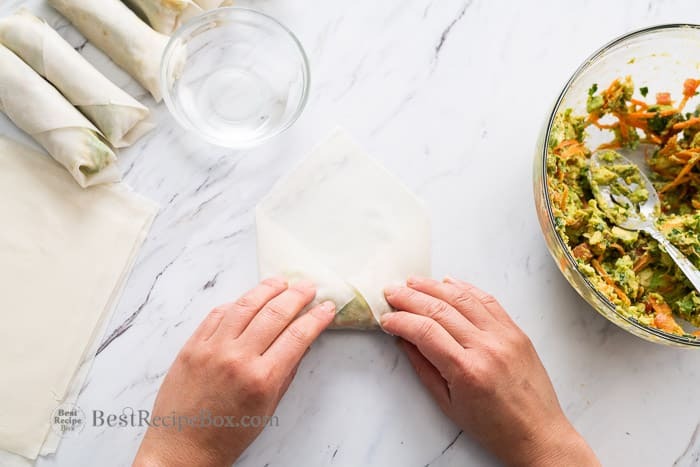 Tuck and roll the wrapper around the filling (watch the video in the post above to see how to roll even and tight rolls). 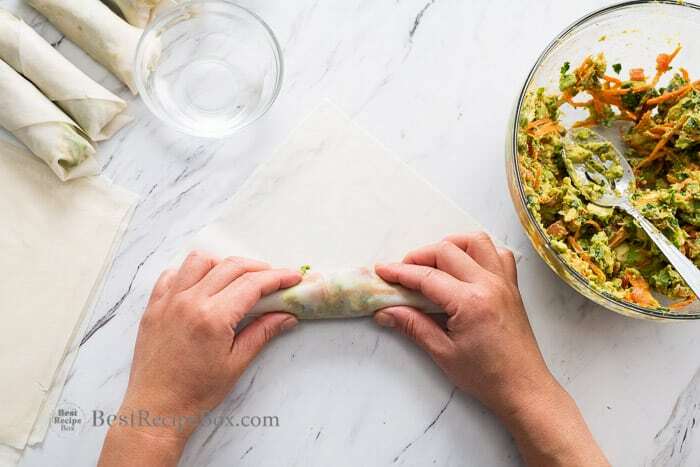 Brush the top corner of the wrapper with water to help seal the wrapper end, and then finish rolling the egg roll. Repeat for all the egg rolls. 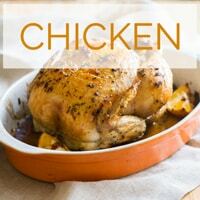 Fill large frying pan with about 1/2-inch of vegetable oil and heat oil to about 350°F. 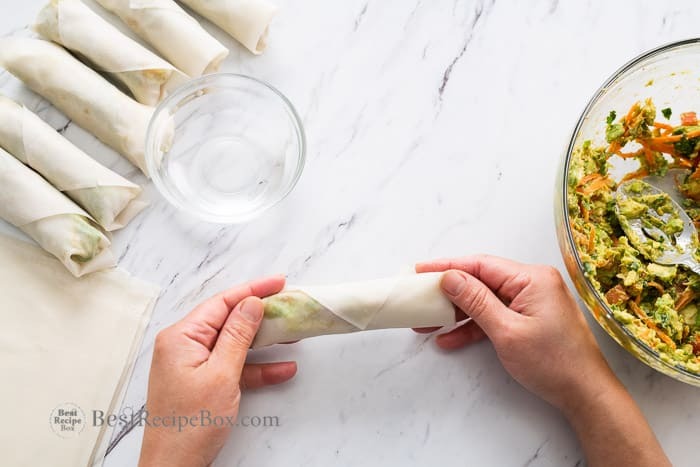 Carefully add egg rolls to frying pan, without crowding the egg rolls in the pan (they will stick together if placed too close. Fry the egg rolls in batches if needed). 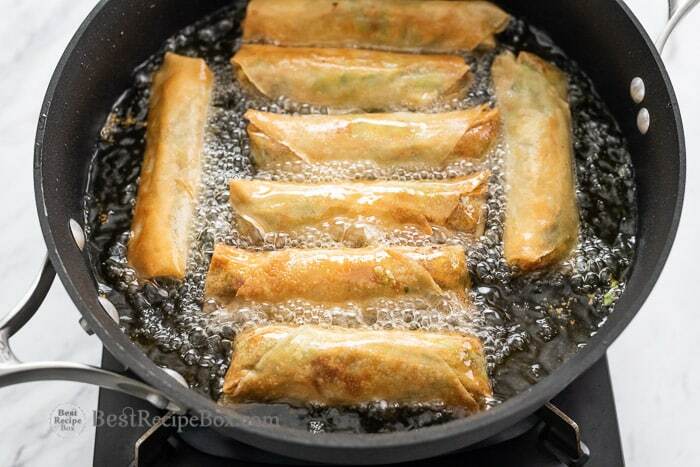 Fry each side of the egg rolls for about 3 minutes or until crisp and golden brown. Remove and blot on paper towel to remove excess oil. I’m so glad to see these here! 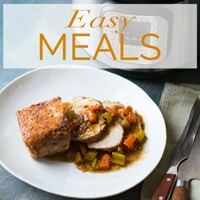 I tried it out immediately for dinner and they were a huge hit with the family! Yay! 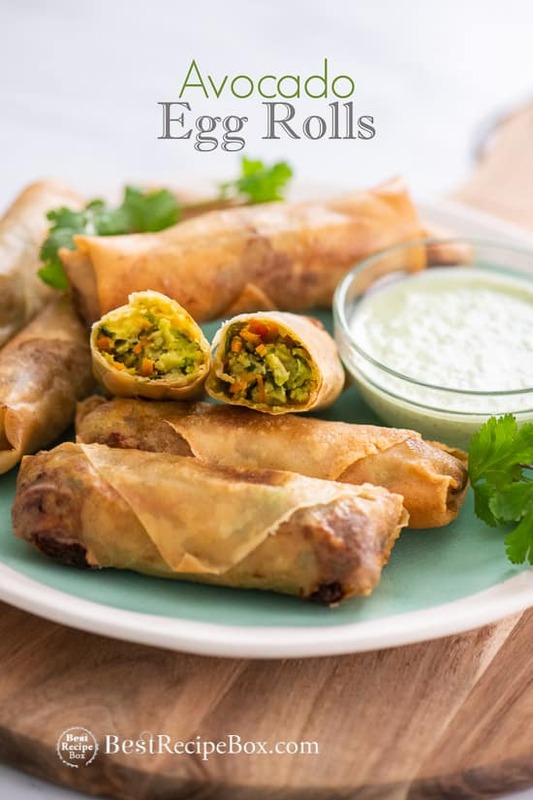 These avocado eggs rolls definitely are always a family favorite. I am SO trying this out for Super Bowl Sunday. 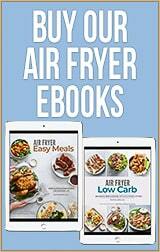 Been looking for savory healthy appetizers for game day and I found the PERFECT one. 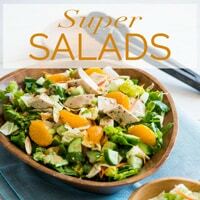 You will LOVE these for Super Bowl Sunday! They’re perfect. Hi Sharon, we tried them baked and the wrapper burst and split. The moisture from the avocado probably was the cause. Maybe it was because we tested them on the thinner wrappers. If we tested it again, we’d probably use the thicker wrappers. If it works for you let us know!